Miami-based Carnival owns the Costa brands, but is trying to wipe its hands clean of legal issues by pointing to the fine print on passenger tickets that stated all legal action must be filed in Italy. Despite legal obstacles that might force them to sue in Italy, hundreds of Costa Concordia passengers and up to 1,000 businesses on the island where the capsized cruise ship ran aground are pressing ahead with U.S. lawsuits seeking millions of dollars in damages from Miami-based Carnival Corp.
Photo by European Commission DG ECHO. The lawsuits filed in both federal and state courts contend that Carnival is the corporate parent of the Costa brand, which operated the vessel, and is ultimately responsible for any safety violations, negligence or recklessness that may have led to the Jan. 13 accident that claimed 32 lives. Investigators say the ship rammed a reef while passing too close to Giglio Island, off Italy’s Tuscan coast. “Costa Cruise Lines is the alter ego of Carnival,” said Edward Ricci, whose lawsuit seeks to represent Giglio Island tourist-related businesses that claim the disaster deterred visitors, polluted environmentally sensitive local waters and depressed property values. Even though the Costa Crociere subsidiary is based in Genoa, Italy, and the Concordia itself never sailed to a U.S. port, Ricci contends that it and Carnival’s other brands all answer to its Miami headquarters. Carnival, he noted, announced a company-wide audit of safety practices after the disaster that is being overseen by Miami-based executives. “It is from this headquarters that the tragic crash of the Costa Concordia could have been prevented by insisting on better training of officers, safer operation and navigation of ships, and elimination of the reckless practice of ‘sail-by salutes,'” Ricci said in court papers, referring to evidence that the Concordia’s captain sailed too close to the island on purpose for publicity and to impress passengers. Similar claims are made in at least four other lawsuits, one of them filed last week that represents 155 passengers from 14 countries, including some U.S. citizens. All together the lawsuits seek tens of millions of dollars in damages from Carnival, which is the world’s largest cruise line. A Carnival spokeswoman said the company would not comment on pending litigation beyond the court filings. In those court documents, Carnival contends that the Italian Costa line is a separate corporate entity and that any lawsuits should be filed in Italy. Lawyers for Carnival say the company does not own the Concordia and does not manage Costa’s day-to-day activities. Still, the companies are closely intertwined. Costa Crociere is a subsidiary of London-based Carnival plc, which appears on the surface to be separate from the Miami-based Carnival. Yet they share the same top executives and board of directors and “operate as a single economic enterprise,” according to Carnival’s court filings. And Costa Cruise Lines Inc. is based in Hollywood, Fla., and issued statements after the accident. Attorneys suing Carnival claim Italian courts often take years longer than their U.S. counterparts to deal with similar lawsuits and that there is no method of bringing a class action in Italy, as the Giglio Island businesses want. Gabrielle D’Alemberte, who represents five U.S. citizens suing over the Costa Concordia accident, said Italy also does not allow attorneys to work on a contingency fee basis in which the lawyer’s fee comes out of any settlement or verdict. She also said damages for pain and suffering and emotional distress are harder to collect. Carnival, however, contends that everything to do with Costa Crociere, the Concordia disaster and subsequent investigations is much more readily available in Italy, including witnesses, documents and other evidence. None of the lawsuits is close to going to trial. U.S. District Judge Robin Rosenbaum, a recent appointee of President Barack Obama, will soon decide whether or not to dismiss the Giglio Island businesses lawsuit based on Carnival’s claim that it belongs in Italy. The passenger lawsuits have to deal with one more complication: tickets for the Concordia cruise include what’s called a “forum clause,” in which the passenger agrees by making the purchase that any legal action would be filed in Italy. The key for their lawyers targeting Carnival in the U.S. would be convincing a judge that Carnival and Costa are identical, and that enforcement of the clause is unreasonable or unfair. Meanwhile, the ship itself remains lying on its side just off the Italian island. 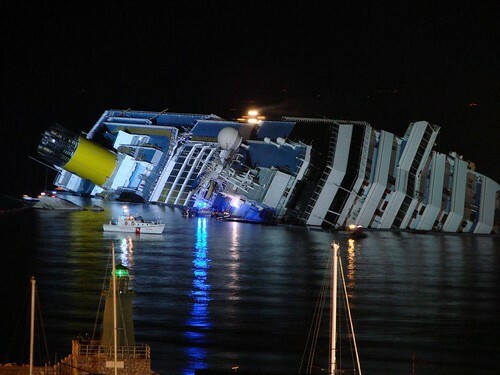 Italian officials say they expect it to be upright and floating again by spring of 2013. A Florida company, Titan Salvage of Pompano Beach, won the bid to handle the work. In addition, an Italian court on Oct. 15 is scheduled to hold a preliminary hearing on potential charges against those responsible for the shipwreck. Capt. Francisco Schettino has said he was distracted by a cellphone call and that his decision to move the ship into shallower waters likely saved lives. Follow Curt Anderson on Twitter: http://twitter.com/Miamicurt.